I want to go in a different direction. Not that this sweater wouldn't have been great--it would have. I might revisit those design thoughts later in the season. I've been thinking about a particular project for eons. A. March sweater (i.e. sweater #3 of 12). Not bad. Not bad at all. B. 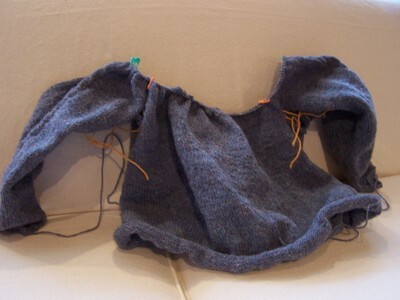 A teaching tool for "My First Sweater" class. E. A birthday sweater for me to wear to a special birthday place. Two days in Ann Arbor? Zingerman's? The Harlot? For real. Yeah, yeah. I've got a few things on my plate. I did get some housekeeping done, though. 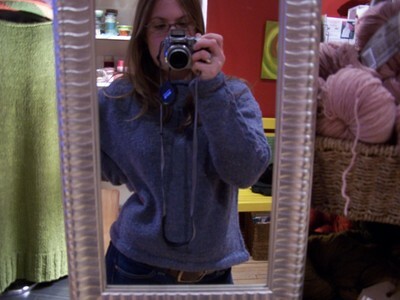 *The blue sweater is back to yarn form. That way I don't feel guilty about an unfinished sweater lying around, just guilty about the fact that I wound the yarn into a ball. It's like the sweater never existed. Neat, huh? *The jester stocking is coming along. 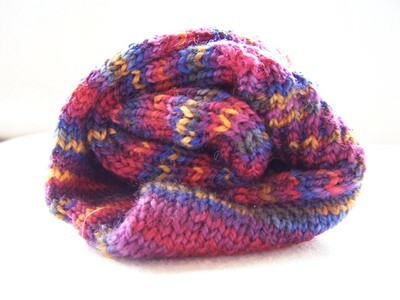 It's stripey, tweedy goodness. 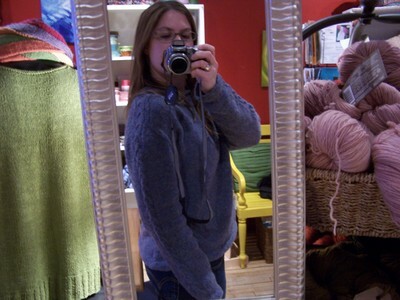 *I've finally picked up sleeve #1 of my very lonely Orchid top-down pullover. It's quite embarrassing how little is left to knit. Maybe I'll have it finished in another six months. Off to swatch. Tuesday's a comin'. Insomnia is miserable, no matter how you slice it. Could there be anything more maddening than wanting to sleep--no, needing to sleep--and lacking the ability to will yourself into slumber? 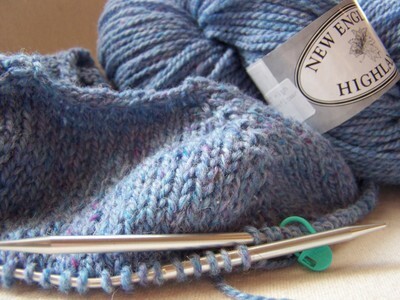 As knitters, however, we have at least one coping mechanism to cling to. 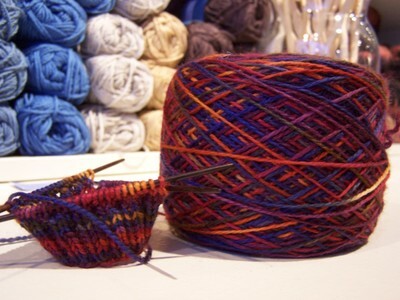 Knitting, methinks, makes everything else seem a little more tolerable. These Christmas stockings are fabulous projects. 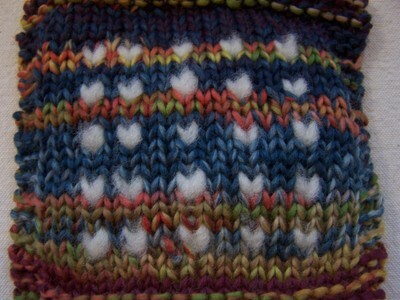 Quick progress, a dash of charted stitchery, no obligation to knit a match....A recipe for success, if you ask me. 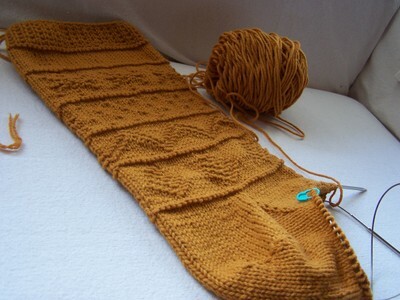 The jester stocking is next and I'm just not sure I'm going to be able to wait. Which leads me to a mini-confession. I fell down the other day. It's beautiful and heathery. It was just sitting on the shelf. It's wool. What was I supposed to do? 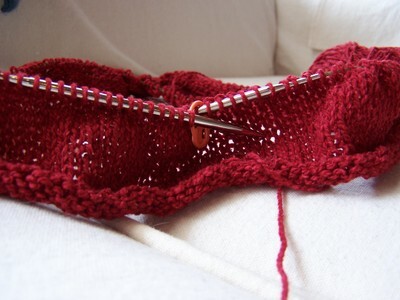 You know how sometimes after tackling a really intense pattern, or knitting with a fabulous yarn, or losing a bunch of sleep due to stitching until the wee hours of the night that you just can't quite get your knitting mojo back? That's where I was last week. I kinda lost my appetite for knitting. I guess I was a little bloated after meeting all those crazy, self-imposed deadlines. 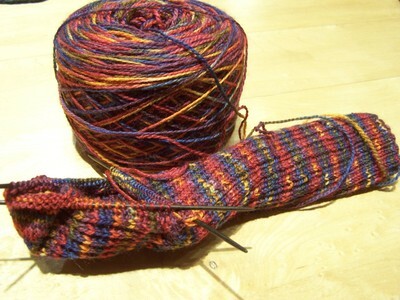 Don't get me wrong--I took a few bites, slogging away at my plain Jane Mardi Gras socks. 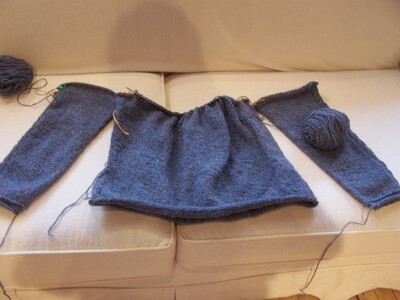 I started a new sweater. The beginnings of miles of stockinette stitch the Gathered Pullover from the Winter issue of Interweave Knits in Silky Wool. 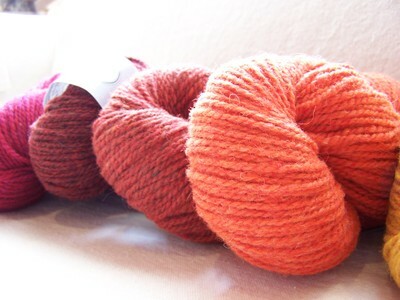 A very pleasant knit. Tweedy! Lightweight! Yet so warm! But there wasn't anything I felt like sinking my teeth into. That was last week. Or, early last week. Friday came, and I started feeling some hunger pangs. It still needs to be felted, but even so, this Christmas stocking is a real beaut. 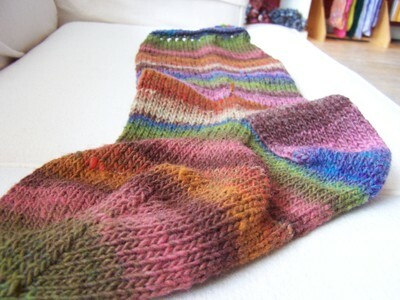 Lovely, lovely Noro. 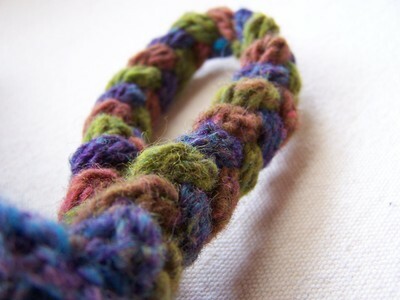 The braided I-cord hanger. So clever. After I finished the stocking, I realized I was starving. This O-Wool Classic is just the right yarn to highlight the purl stitches in this gansey-ish stocking. Now I'm in a full-on wool gorge. I've got a bunch of projects ready in the wings. Look at all that heathery, fleck-filled goodness. Wool. Yum. 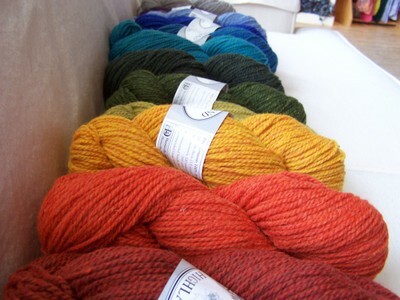 These yarns, in addition to being of the highest quality Merino-cross wool, are unparalleled in color design. 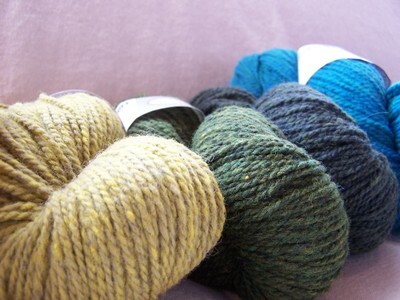 All the color ways are heathers--blends of saturated hues that give both textural and visual interest to hand knits. 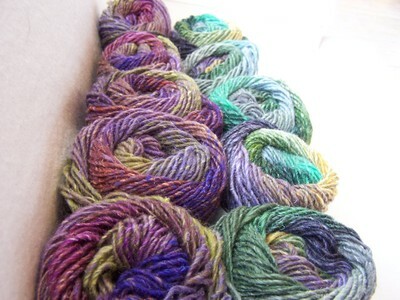 And they're dyed and spun here in the U.S., which, in this global market, is becoming increasingly rare. But, as we all know, supporting American-made products make sense for a whole host of reasons. Especially when they are of superior quality. Uh-oh. I feel a rant coming on. I better stop. 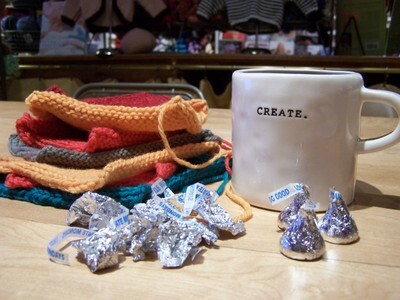 My knitting appetite has already gotten me into enough trouble as of late--I don't need my mouth to do the same. Truth be told, I would be more enamored with thrums if they weren't so dang laborious. And if I didn't have such sweaty hands. BTW: I will insert the ultra-specifics at a later date. My thoughts? It's okay. It's definitely a sweater I'll pull on over and over, but in all reality, I could have gone a little smaller. I've got quite a bit of room in the waist and bust. And I wasn't really looking for an over sized sweater. In fact, this hardly resembles the original article at all. It's the Northern Michigan version, where it's just too cold to wear belly shirts. Ever. Oh, well. Wool is wool. And man, I just love that stuff. I feel a little like I've been run over by a truck. All this knitting has me completely wiped out. Also, my brain is empty. I am so close to bounding across this finish line, I can taste it. The sweater is done. I did not make my 10:00 p.m. deadline on Saturday night, but I finished at 4:00 p.m. on Sunday. It is currently blocking and will be ready to wear to tomorrow's meeting. Pictures to follow. The gauge class on Thursday was fun. I learn so much more when I have to explain how I know what I know. Me (looking out of the corner of my eye at the 6th grade student with head flung back, yarn & needles in lap, moaning loudly, obviously looking for my undivided attention): "Hey, H___, how's it going over there?" H: "Ohhhhh. I need to take a break. This is killing my hands." 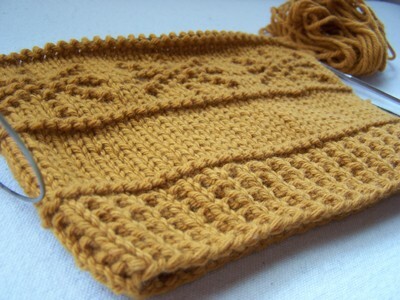 There were two rows on the needles. She'd been sitting there for 15 minutes. What a hoot. I also finished the sock--or at least the leg and heel flap of sock #1 (didn't make it to sock #2)--for our class this morning. Plus, I have this baby all prepped to demonstrate ye olde Kitchener. It's amazing how quickly your hands can work on autopilot under pressure. There's still the issue of the thrumming, but come on. I've got 24 hours. That's practically a lifetime. Too early for a champagne toast? I am seriously doubting at this point in the game whether or not I am going to make this here self-imposed deadline. I know. Embarrassing, isn't it? There'd be more done--I swear--if I hadn't spent an hour and a half ripping back several rows last night. And then, of course, the matter of Super Tuesday. My blood pressure is juuuuust dipping back into the "normal" range. I feel like I just ran a race. Wait. I am running a race. I just might make it across the finish line if I don't sleep between now and Tuesday. 1. The Sweater--I'm about 2/3 of the way through it. And every row gets quicker, because I'm decreasing. So in just a few rows, I'll only have, like, 280 stitches per row. That's good, right? 2. 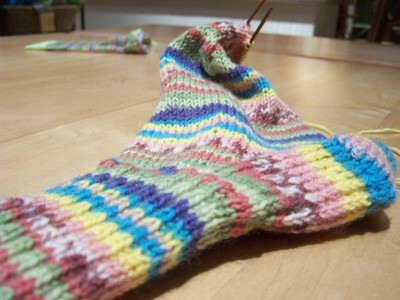 The Mardi Gras sock. It's plain. Simple. 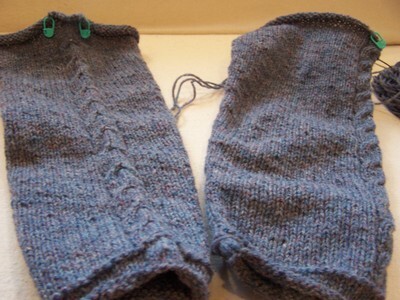 Technically, I only need to finish the leg and the heel flap of sock number one before Monday morning, but in a perfect world, I'd like to have sock number one finished and be ready to turn the heel of sock number two. It could happen. 3. Approximately six swatches for Thursday evening gauge class. And by Thursday, I mean tomorrow. 4. 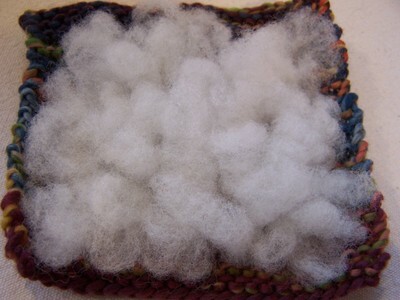 A thrummed mitten. You know, for the demo I'm giving on Tuesday night. 5. 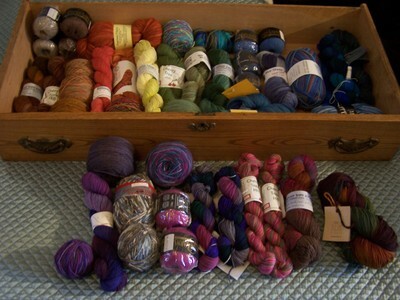 I need to cast on to 15 pairs of needles for a school carnival at Grand Traverse Academy on Friday afternoon. "Seriously. Now, I know this [insert financial/emotional/knitting crisis here] seems tough and mind blowing and inescapable at the moment, but it can be done with much less pain than you think. If man can break the constructs of space and time and gravity to land on the moon, I'm pretty sure you can [insert solution to financial/emotional/knitting crisis here]. It can be done. You can do it. This is really not that bad. Seriously." Usually this helps me to refocus and keep my eyes on the prize. And if that doesn't work, I grab a huge pot cup of coffee, which in turn propels me into a trance-like state of frenzied task-mastering. So either way, I manage to come out on the other side. And just for kicks, I thought you'd enjoy a sneak peek into the Dark Side. People who live in glass houses shouldn't take showers at noon. 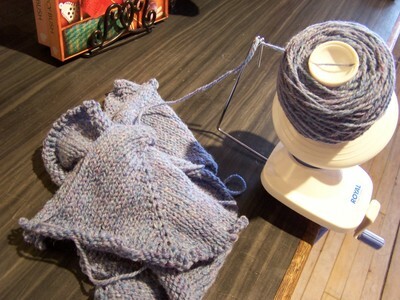 I have never been this diligent about a knitting project before. Never. 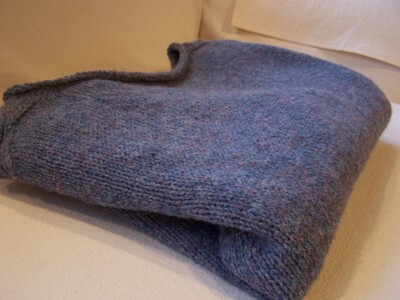 I am about six rows from joining my sweater at the yoke. My only concern with the sweater thus far may be a little more important than I'm giving credit to at the moment. Of course, rather than doing some mind-bending math (I just don't have the brain space for it right now), I'm going to keep on keepin' on. Hey, I'll know by Saturday night. That's my deadline. 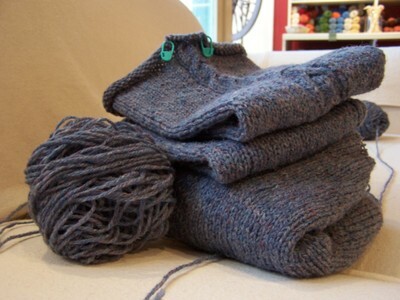 The sweater will be finished by 10:00 p.m. EST on Saturday, February 9th so that it can be wet-blocked (and dry) before the Tuesday evening Close Knit Guild meeting. This is my cable challenge project. The challenge? 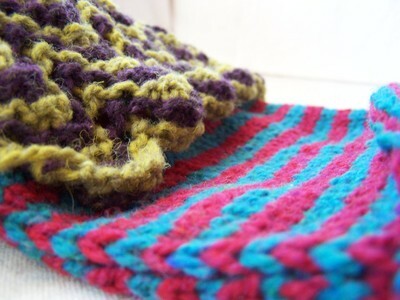 To incorporate cables into any knitting project of your choosing. I'm very behind on my tally. Very. But. As of Saturday night, I will have finished two of twelve sweaters for the year, and the next will not be due until March 31st. I feel a sock kick coming on. 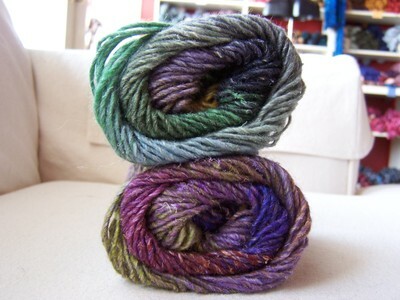 Lisa Souza superwash merino sock yarn from Convergence '06 in Color Mardi Gras. Just in time for Fat Tuesday. Glutton that I am, I had to start a new pair. Come Wednesday, I will repent. 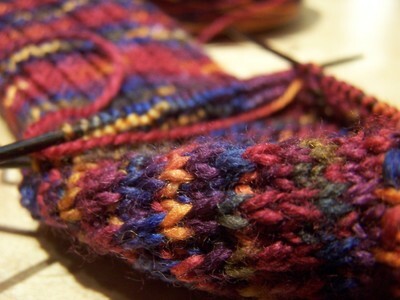 I will finish all those socks currently on needles. But until then, bring on the paczki!